Using this plugin, also the administration of your Planyo site can be done on your website. If you website uses a login, your moderators/admins/agents will be automatically logged into planyo (Joomla/Drupal/Wordpress are supported by default, otherwise you need to make changes to the source code to get this to work with your CMS). 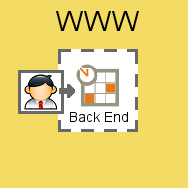 The back end is integrated using an iframe. This iframe, however, is auto-resizeable based on its contents, and so is not separated from the rest of your page as normal iframes might be (e.g. there will be no extra scrollbars). CHF 39/month Buy monthly subscription to the extension. The extension is hosted on our servers so no installation is required. This is the easiest way to use the extension. First month is always free of charge so you can test the extension. After the initial 30 days your Planyo account will be automatically billed the monthly fee until you cancel the subscription for the extension. Your Planyo credit must be positive in order to start the monthly trial.